It may sound like a joke, but not when someone gets hurt. The US Consumer Product Safety Commission (CPSC) and Health Canada, along with a company called Flushmate, have issued a recall for the Flushmate III Pressure-Assist Flushing System. According to the recall statement, Flushmate has received 304 reports of the Flushmate III Pressure-Assist Flushing System bursting at the weld seam. This causes a release of high pressure that can lift the tank lid and shatter the tank itself. There have been 14 reports of people being injured or cut due to the product bursting. And there are a lot of these units out there… 2,330,600 were sold in the US, another 9,400 in Canada. 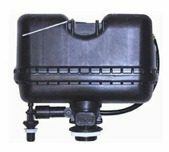 The Series 503 Flushmate III Pressure-Assist Flushing System subject to the recall was sold in Home Depot and Lowe’s hardware stores and by other distributors and plumbing contractors nationwide. Complicating the recall is the fact that the system was also sold to toilet manufacturers such as American Standard, Crane, Eljer, Gerber, Kohler, Mansfield and St. Thomas. The recalled units were manufactured between October 14, 1997 and February 29, 2008. So how do you tell if one of these is in your toilet? 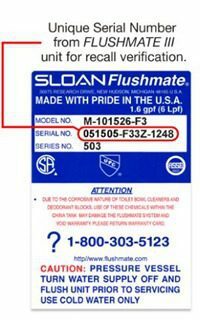 The serial number can be entered into the company’s website at http://flushmate.com/recall for verification. Flushmate also said they can verify the number over the phone at: (800) 303-5123. A photo of the Series 503 Flushmate III Pressure-Assist Flushing System, provided by the company, is at the top of this article, and an image indicating the location of the serial number on the label is set to the right. Flushmate writes on their website that consumers with units verified as being part of the recall should turn off the water to their toilet. After verification, Flushmate said they will send the consumer a free repair kit with installation directions and a link to an instructional video.